« The Blueprint 3 by Jay-Z. Real Talk. Pearl Jam used to be kings. They ruled the musical landscape and they did it by doing their own thing. No music videos, a fight with Ticketmaster, Pearl Jam were a band with an agenda, a group of guys who became giant stars pretty much by accident and never seemed to be interested in being stars. Look at their actions all through the 90’s, this was not a band with an interest in going with the flow and doing what was expected. And people loved them for it. When they did a tossed off cover of “Last Kiss” it became a radio staple. In the early part of this decade, Pearl Jam found themselves less popular but holding on to a devoted fan base that hung on every album track, b-side, and bootleg. But someone somewhere must have charged into a room and scolded the band. “You used to be the biggest in the world, now you’re just another niche group. Play to the cheap seats!” This would explain Pearl Jam’s self titled record in 2006. “Pearl Jam’s return to Rock”, I recall Rolling Stone crowing. Loud, angry songs with titles like “World Wide Suicide”, delivered by Eddie Vedder with the old familiar yarl. It was a goddamn snooze, pandering to the listeners and radio programmers who had lost interest in Pearl Jam’s later career choices. Which brings us to Pearl Jam’s just released Backspacer. The pandering dullness continues. Backspacer is an unabashed play to a mainstream that this band never appeared to have any interest in in the first place. I had always been under the impression that Pearl Jam could do whatever they wanted. Right now, what they want to do is phone it in. 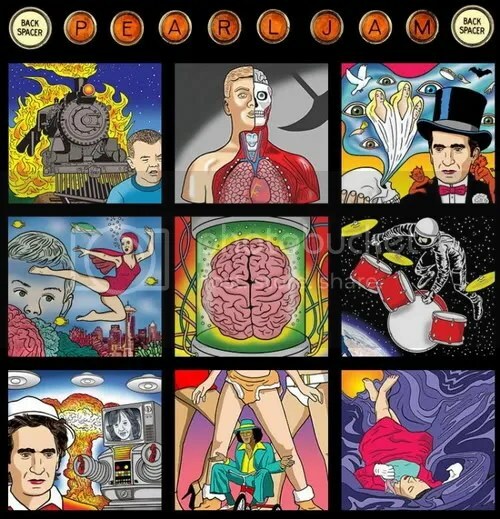 Beyond the bland opening four tracks, a few songs (“Amongst the Waves”, “Unthought Known”) are vaguely reminiscent of heyday Pearl Jam recordings, more so for certain sounds than in the song writing, which remains benign and largely hookless. That might be the worst part, since Pearl Jam made their name on some tremendous choruses (think “Evenflow” and “Alive”) yet on Backspacer only the general momentum of their earlier work is cited. Backspacer is hardly the worst record I’ve ever heard, but it’s easily forgettable. Pearl Jam might move some units with this one, but they haven’t added anything to their recording legacy. This entry was posted on September 23, 2009 at 9:14 pm and is filed under Music...Music, Reviews. You can follow any responses to this entry through the RSS 2.0 feed. You can leave a response, or trackback from your own site. Disappointing, isn’t it? I remember when I used to be so excited for the new Pearl Jam release. Now it’s just depressing.